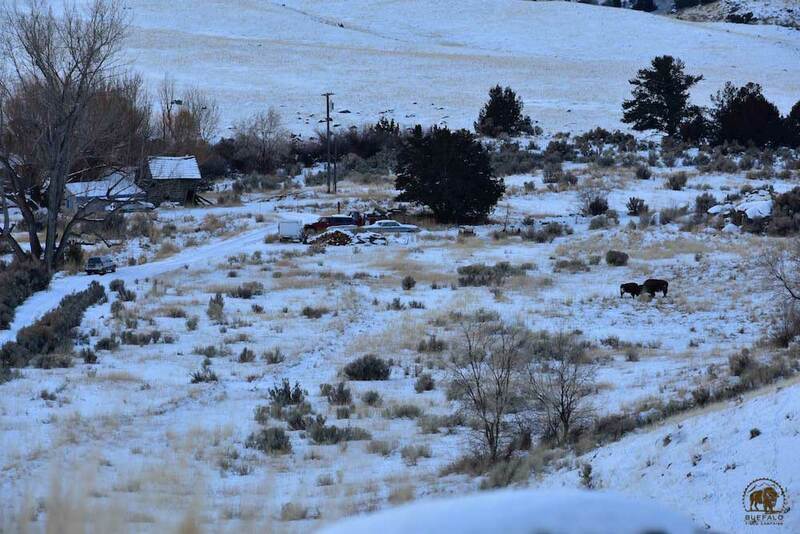 A lone mom and calf pair find refuge from hunters on a conservation easement. This has not stopped hunters from eyeing them multiple times each day. Photo by Stephany Seay, Buffalo Field Campaign. You’ve probably noticed that it's been a while since we’ve written a bonafide Update from the Field, mainly because there have been no buffalo in Montana’s Hebgen or Gardiner Basins to report about. The few buffalo we have been seeing on patrols have been deep in the park, visible only through binoculars and spotting scopes from most of our patrol areas, or up-close and personal within Yellowstone’s boundaries. Certainly, the mild winter we’ve had has a lot to do with it, but other more nefarious factors can’t be ignored. Consider that each year, hunters gather at Yellowstone’s north and west boundary, killing nearly every buffalo that dares migrate into Montana. That migratory memory is being severely compromised by the impatience of hunters, who feel they are in a race against Yellowstone’s trap, as well as in competition with the many other hunters crowding the small hunt zones. Should the status quo continue, that migratory memory could eventually be wiped out. 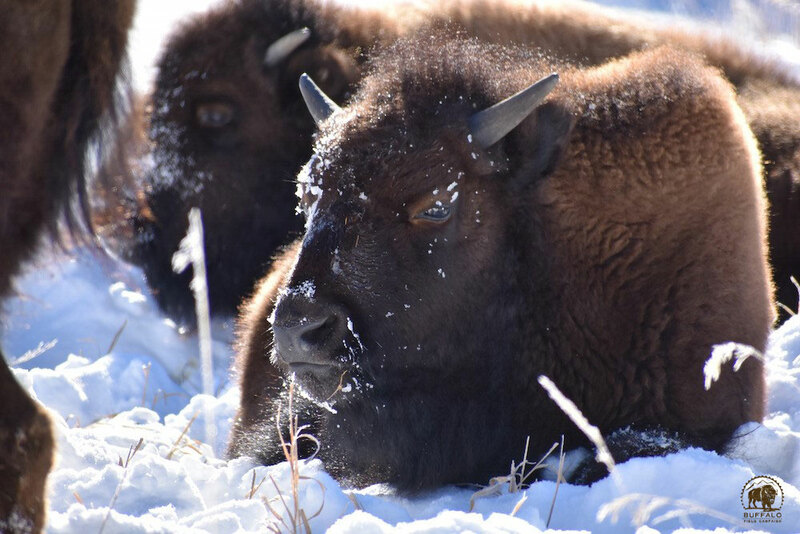 Yellowstone’s Stephens Creek trap holds even more of the blame, capturing for slaughter hundreds more wild buffalo each year — far more than hunters — as they attempt to migrate to winter ranges. The absence of the buffalo is heavily bittersweet; on the one hand, refraining (for now) from migrating into Montana, they are keeping themselves safe from hunters and Park wranglers. 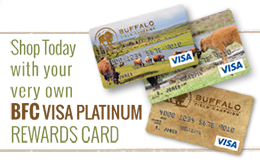 On the other hand, buffalo need to roam and the land and other wildlife need their presence in order to be healthy and whole — without them the land is incomplete. That said, we have been called to open our Gardiner camp on the north boundary. A few weeks ago, a couple of bulls were spotted outside the Park, in a safe place at the time, but who knew what they’d choose to do? The bulls soon moved back into the Park not to be seen again. A couple weeks later, we learned of another small group of buffalo who were making their way into the Gardiner Basin, so we didn’t hesitate to initiate our presence in the field there. They, too, disappeared unscathed. Then another two buffalo arrived — a lone mom and calf. The fact that they are without other family members is concerning, but they seem to be doing okay. For over a week, they have been staying safe on some private land — the Chapman conservation easement — which is dangerously close to the hunt zone. The presence of these vulnerable two has drawn the attention of many hunters who are chomping at the bit to fill their buffalo tags. Some hunters were so desperate to make their kills that, last week, they allegedly trespassed onto the Chapman easement and tried to chase these two into the hunt zone. Thankfully, they were unsuccessful. After being harassed, the pair returned to safety where they remain today. It has been reported that the Chapmans intend to file charges against the trespassers. Nevertheless, there have been at least five different hunt parties out every day, eyeing these buffalo, just waiting for them to cross into an area where they can be shot. With all of these guns up against two buffalo, madness will ensue if the buffalo do choose to move into huntable areas. The competitive edge is intense; every day we see these gas-guzzling trucks drive up and down the road for hours each day just waiting for these buffalo to make the wrong move. For now, the pair seem to be perfectly content where they are and show no signs of moving anywhere. A fat and healthy yearling beds down with family, enjoying some quiet time in Yellowstone’s Blacktail Plateau. Photo by Stephany Seay, Buffalo Field Campaign. The lack of imminent danger has enabled us to take our patrols into the Park, doing recons to see where the buffalo are, and how close they are to coming to lower elevations and, hence, the killing fields. Nearly every day, we’ve been heading in from the Park’s north entrance, moving up through Mammoth Hot Springs and east towards the Blacktail Plateau and Lamar Valley. Here is where we are finding hundreds of buffalo, seemingly content, able to find enough food to curtail the drive to seek lower elevation winter range. Because our regular field patrols have been so void of the presence of buffalo, it has been wonderful to head deeper into the Park and spend time with these gentle giants who are safe from human harm. And, for so late into the winter, the buffalo we have encountered look fat and happy. Bull buffalo confined within quarantine (domestication) pens, inside Yellowstone National Park’s infamous Stepens Creek buffalo trap. Photo by Stephany Seay, Buffalo Field Campaign. Not all buffalo in Yellowstone are content. Inside Yellowstone’s Stephens Creek buffalo trap, Yellowstone confirms 57 bull buffalo continue to be held “for quarantine purposes.” These bulls are trapped inside two pens, being fed hay, repeatedly tested for exposure to brucellosis, and consequently, some die from injuries caused by the constant human-handling. 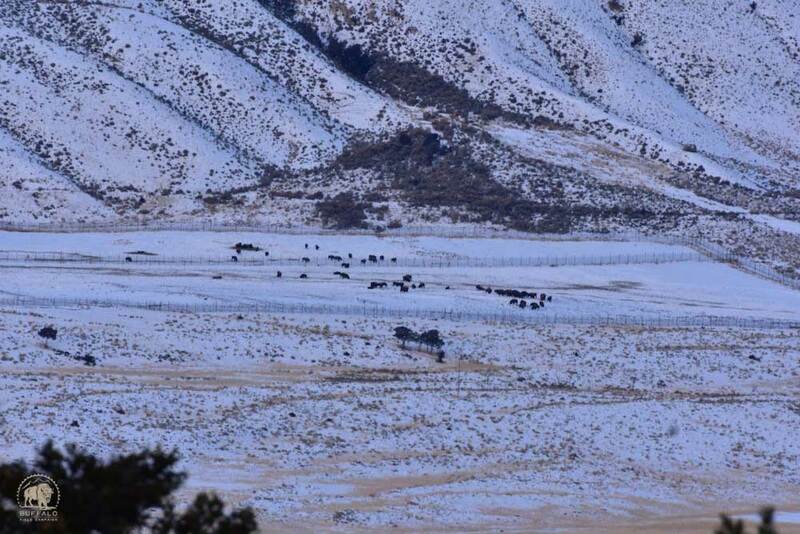 In fact, Yellowstone just confirmed that a total of 14 buffalo have been shipped to slaughter through their quarantine program. A few weeks ago, on a volunteer field trip to the Gardiner Basin, we counted approximately 70 bulls in these pens. We noticed less this week, and Yellowstone confirmed it. Being so far away, as the photo above shows (taken with a 500mm lens), it is always difficult for us to get an exact count. To date, none have been transported from that facility, and strangely, the buffalo slated to go to Ft. Peck are coming from Corwin Springs, where APHIS has been using buffalo stolen from Yellowstone in an unapproved GonaCon (chemical birth control) study. It is unclear at the time of this writing if these buffalo were GonaCon subjects, or if something more secretive has taken place without the public’s knowledge. We will let you know as we get more details.